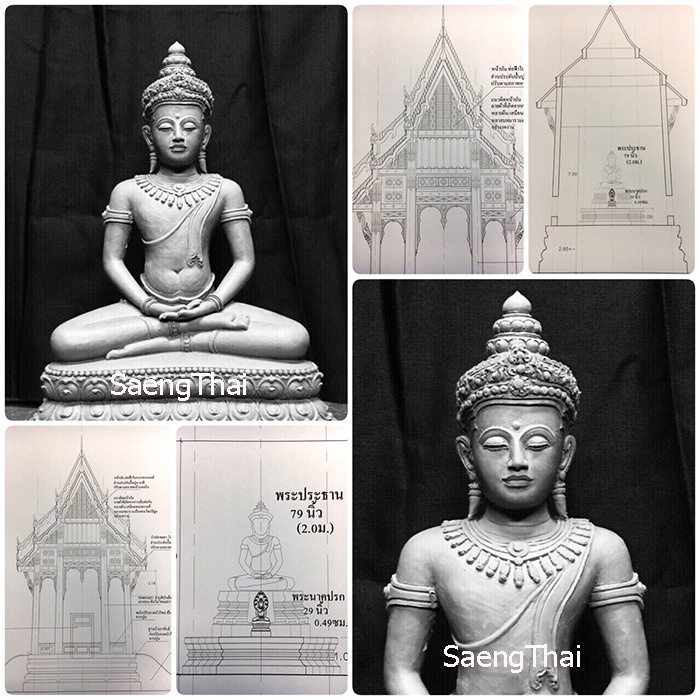 Above is the design for Phraphatarn Yai Ubosot, Wat Pa’ Phromnimit, Sisaket. 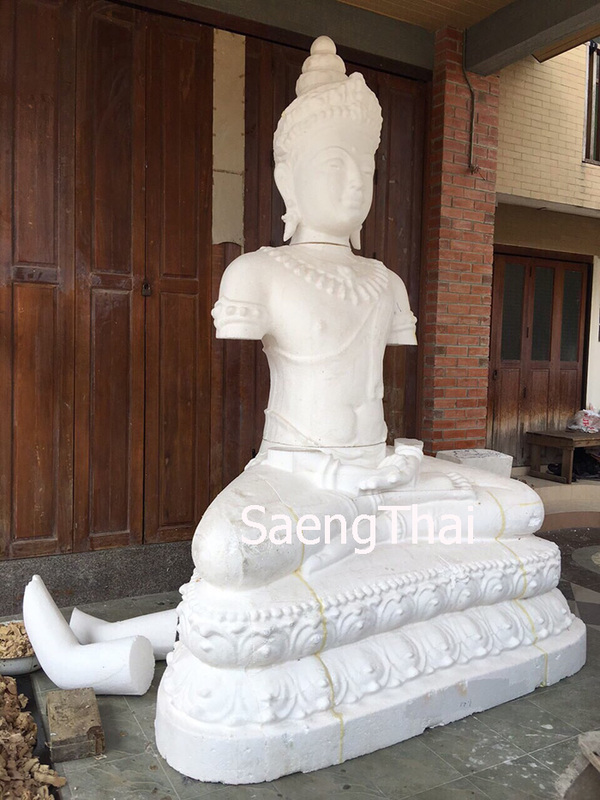 It resembles Buddha images commonly found in Cambodia or Laos. It was done according to the instruction from Ven. LPu Sukh Kovito the current Abbot. Ven. LPu has been weak for years and been getting in and out of hospital lately. 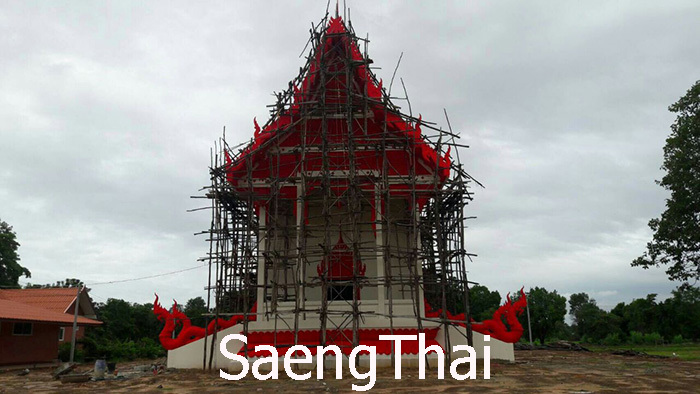 It was his wish to see the Ubosot completing and all to gather for a wholesome purpose for donating to the Ubosot building or the casting of the big Buddha image (featured above). Below are some photos of the Ubosot currently rushing to be completed. 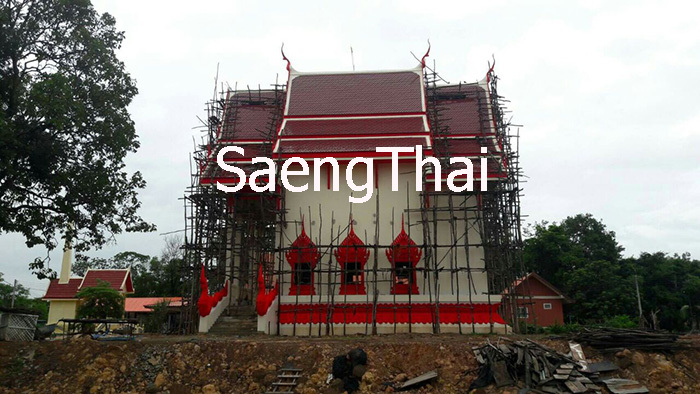 Below is an image of the mould in the making for the PhraPhatarn Yai Ubosot. Below is one of the image of Ven. LPu in the hospital. Very recently discharged and Ven. 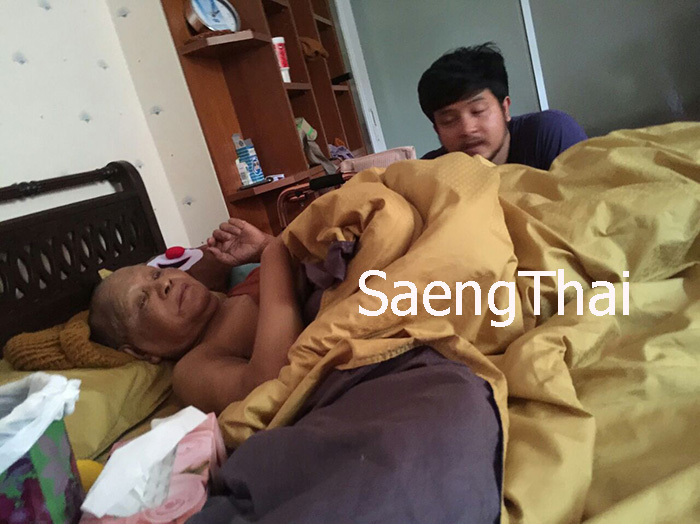 LPu wants to head back to Sisaket to prepare for his vassa this coming 20th July 2016. Actually we do not need to worry much for this Ubosot and the Phraphatarn Yai because Ven. LPu has the support of some wealthy and influential people. But according to Ven. LPu, he wish to let this barami of Ubosot building and Buddha image casting be shared will Buddhist all over. Ven. LPu always make sure that the villages gets to participate in the barami of such wholesome danas and it mustn’t belong to only one sponsor. So this year we would like to open up this opportunity to all whom are interested to sponsor brass nuggets from a minimum of RM100 for casting the main Buddha image plus you can submit your paen duang in a brass foil to be melted together with the metals to cast the Buddha image this coming 12th November 2016. All are welcome to participate at temple in Sisaket. We do not like to impose any monetary value eg minimum RM100 but we do not want people to abuse this opportunity either. This opportunity involves much work and money too on us. We will let you dedicate this merits to your loved ones too, other than you own names and particulars, you may also include your parent or wife or children together with your donation. 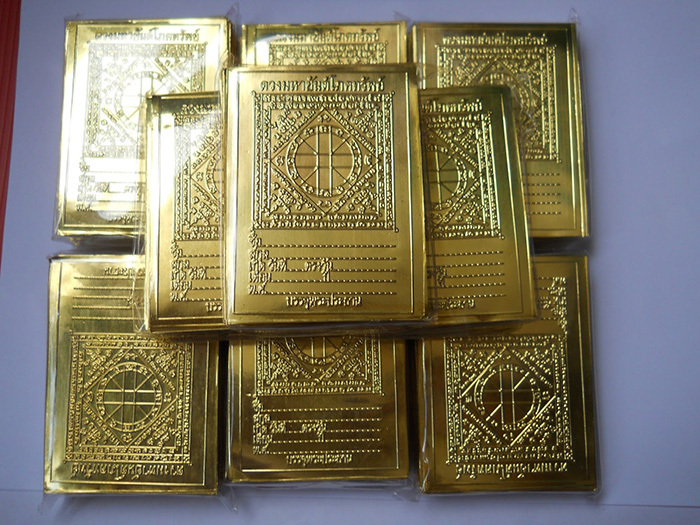 We will arrange these paen duang with your particulars to be melted to make the Buddha. The merits are discussed in the earlier post. Let’s come together, all devout Buddhist all over, to make Ven. LPu wishes come true this coming 12th November 2016. Roon Raek Rian KhuanThoong MahaSeththi (Millionare’s Bag of Prosperity) of Wat Pa’PhromNImit Sisaket, Ven. LuangPu Sukh Kovito. It will be chromed silver and gold. The rian above was sponsored by Mr. C.K. Ng, 10,000 pieces in total. All will be offered to Ven. LPu, it will be up to LPu’s discretion, what LPu wants to do with it. This rian was made with Ven. LPu’s permission, it will be the last from Reverend. This has been the 2nd or 3rd time Mr. Ng offered rians to Ven. LP or being given permission to make them. Ven. LP Sukh Kovito seldom make amulets and has denied many request to make especially from the committees. I am sure many amulet enthusiasts have heard of how committees uses famous Reverends popularity to make money. Permission are always granted to Mr. C.K. Ng for a simple reason, he paid for everything and done as accordance to Ven. LPu’s wishes and instruction. All proceeds from amulets are donated to Ven. LPu. Sadhu again to Mr. Ng and his family for his efforts to propagate the right Buddhism teachings and lead by example the right way to do dana. Though Ven. LPu is seldom heard of in Thailand, not even to mention out of Thailand but Ven. LPu has a steady group of followers and supporters both in Thailand and in Malaysia for a simple reason. Ven. LPu is a rare gem and has stood steadfast to the teachings and practise of Archan Mun. One of the main reason Reverend dont make amulets is because there has been reports among followers in Pichit and Sisaket that LPu’s amulets will often dissappeared on its own especially when mishandled. Ven. LPu is very wary that laities will have bad things befall upon them if his images or amulets are misplaced. So for those whom has his amulets from us , please handle with care. Other than normal phims of copper, solid gold, silver and samkasat (tri-color) will also be available for collectors (update later). The objective of this batch of amulets will be to help contribute to the making or casting of Phraphatarn Yai in the Ubosot. Those whom are interested, kindly call me, Derrick at 012 692 1233 or Whatsapp ID Pu Reusi Porgae or Wechat ID Porgae or LINE ID Porgae. Thank you.